6" fragrant deep purple blend with dark purple eyezone and gold picottee edge above yellow green throat. 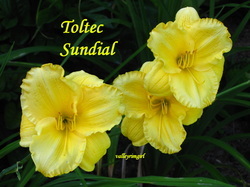 7" ruffled very fragrant sunshine yellow self with a green heart. Known for opening after sunset. 5" pink with soft rose eye and soft rose ivory filigree edge above green throat. This picture shows the very first flower it had here in my yard.